“One last question – are you really that good?”. “Yes, of course I am”, were designer Aki Vänni’s confident words as he convinced us with the new name for Happit. We were living late days of March. We were about to go live with the first version of our new brand story and expose it for public comments. The first step of this incredible journey had been taken. Although it is just not about the name, name and story to support the product vision is one of the million things that new startup has to get right in order to succeed in international markets. So often B2B technology startup founders are driven by their technological vision that they forget to explain the value of their product in the language of the audience. Where did our story get started then? It is clear that no one wants to be frustrated in worklife – it just kills the motivation. Happit – Single Click Learning service – was born to fight for a better digital employee experience, better productivity and happiness. This was our main message as we entered the first major international event in May to review our new brand for Microsoft Office 365 community. Unsecured of what to expect, we hoped for the best. Disturbing message combined with positive energy and true devotion of our team started to work little by little. By the end of the first day at the conference, it was obvious that we would run out of the t-shirts. It was similar stuff as on the next booth, but we received a lot of comments on having the best swag in town. Some were ready to sign up to become partners right at the booth. At the end, our #HappiTimes twitter campaign gained more than 220 000 impressions over the period of one week. And #HappitFamilyBbq became an instant success with some of the bigger names of the community joining it. Not only did the story work for the audience, but it started to weld our team together. Mission of bringing employee training and support one click away, for them to be productive and happy made our team’s every day work more meaningful. Shortly, all what we did was bind to the theme. Our partner network got a name #HappitFamily, community of specially honored individuals who help our team along the way were named #HappitFellows, our in-house brewed beer was re-named to Hoppit. Our vision for the product is exceptionally bold. 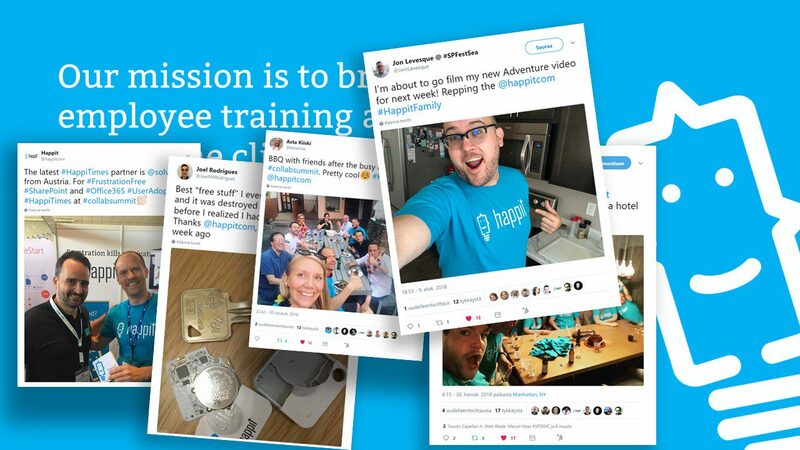 We have noticed that in-context training does not only help onboarding of new software, but when used holistically for learning and ongoing support, Happit turns into ultimate digital tool for employee productivity. Something that should be on agenda of any CEO and is in very essence of Microsoft strategy. So, not as surprisingly as one might think, in June another big accomplishment awaited Happit. The solution was awarded as Microsoft ISV Country partner of the year. For us it meant that we had been acknowledged and ready to move on finding partners in new markets. During the past six months we have been traveling to most of the SharePoint Saturday events in Europe. We have visited several countries to make our name visible for Microsoft roles that are interested in Customer Success Management. I am glad to say that it’s starting to pay off. We have opened in average two new partner countries a month, resulting into a partner network of 12 countries with partners ranging form single-employee consultancies to global ICT giants. Often total strangers give us feedback that we seem to be everywhere and fighting for the right cause. User adoption of cloud services – Microsoft theme of the fiscal – really matters. And we matter for the community. This fiscal, Microsoft took a bold stand for user adoption. Teams of customer success managers are hired across the globe to ensure that cloud service customers get return for their investments. Microsoft partners are encouraged to take part to this movement and various trainings are offered to build the ability. If it will be anything like previous Microsoft programs, we will see things really pick up during the next six months. New ways of working, user training and employee engagement will hopefully take over the center stage of discussions. And all will boil down to understanding how to do user adoption in scale. Something that has been the goal of Happit since day one. Now as Sunday is turning into night, I am flying back from yet another weekend of work. Although, my #HappiTravels keeps me too much away from my loved ones, having a cause gives me the energy to my better self also at home. Next week, work days will bring bigger and smaller battles to fight and win. Yet I could not be more excited. It is the week when we get to activate a trial to a new type of player. It is the week when the first Microsoft product group will start testing if Happit is their choice of in-context training. It has been said that more important to destination is the travel itself. With #HappiTravels I couldn’t agree more. It is not something that you can plan, but it is rather about seizing moments and enjoy the ride. I am truly excited to see what the next season of #HappiTravels will bring to my way. The next episode of #HappiTravels ?